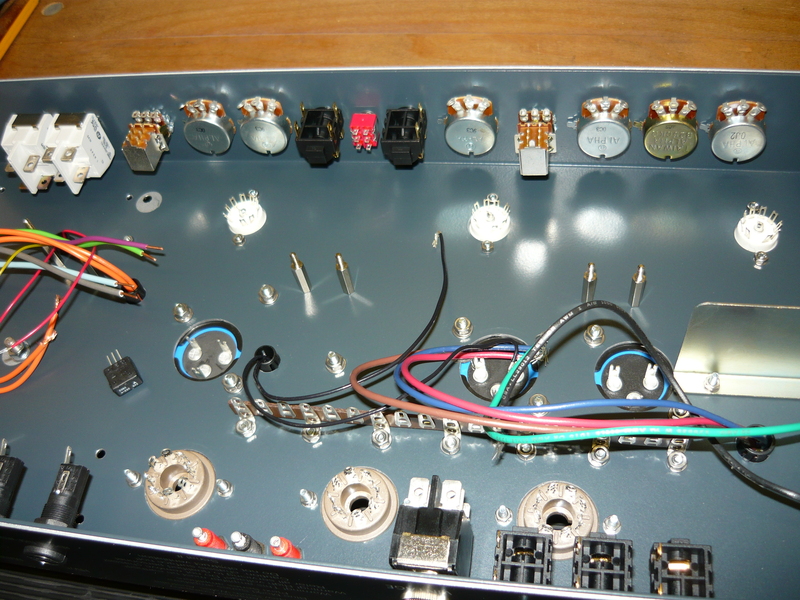 Here is the 2nd in our occasional series of blogs where we publish a visual progress report of a custom-order amp build. 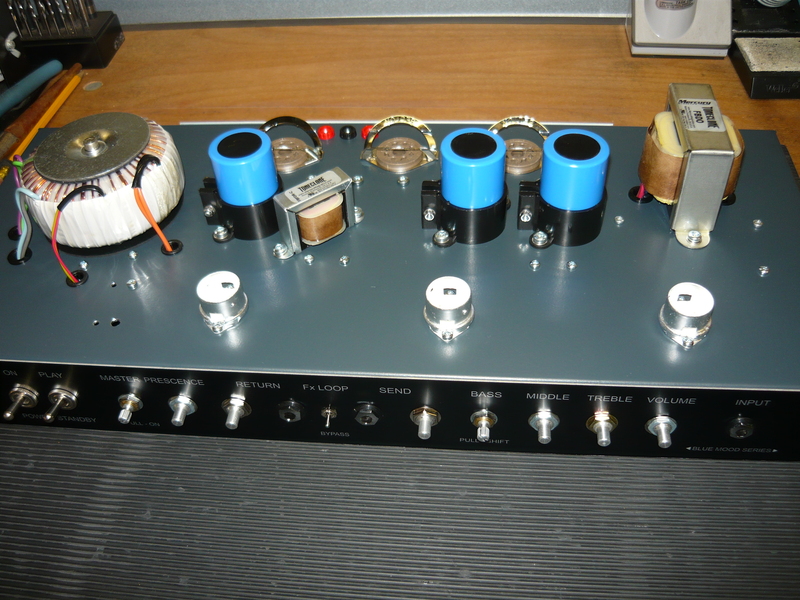 This example shows a Blue Mood series amp chassis under way for Dean Gardiner. This amp is a customised variation on the Blue Mood concept, with the addition of a fully-featured valve (tube) driven FX Loop. The FX Loop features separate Send & Return level controls, as well as separate Send & Return buffer stages. Obviously the Return buffer stage can be configured as an additional gain stage, or purely just to balance the wet signal against the dry signal. 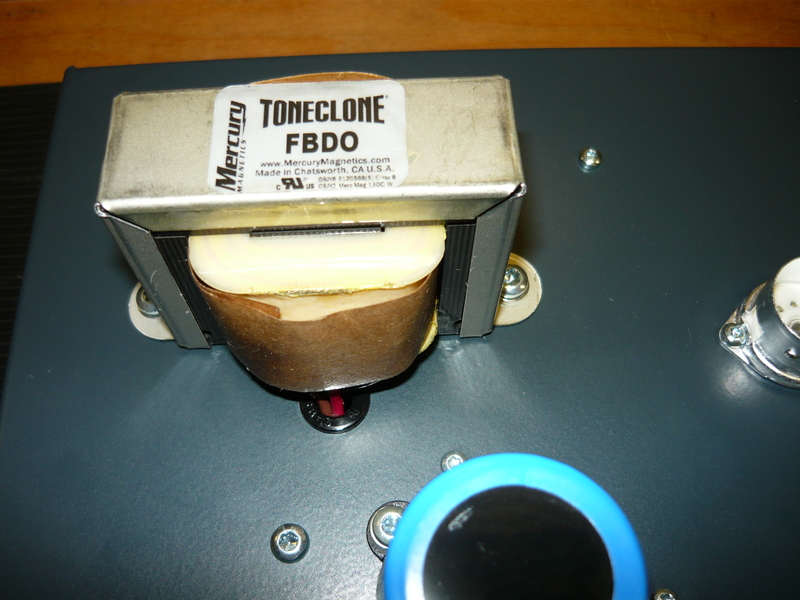 The FX Loop can be activated or bypassed by means of a toggle switch mounted on the front control panel. There is no need to be messing around at the rear of the amp in the middle of a gig or session. 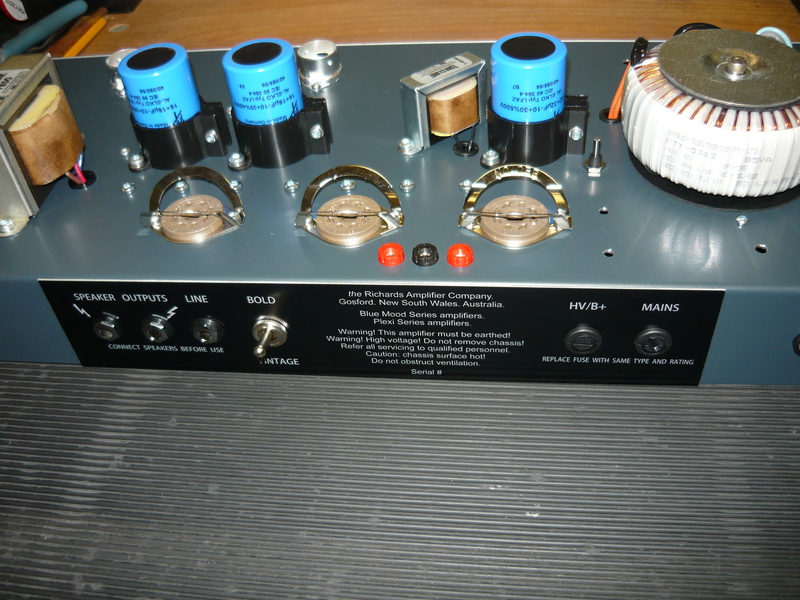 This 18 watt Blue Mood head is built around a pair of 6V6 output valves, with power transformer from the very fine Harbuch company of Sydney, plus output transformer & choke from the very fine Mercury Magnetics company (USA). The 6V6’s can be operated in fixed-bias mode for maximum power & dynamic range, or cathode-bias mode for a sweeter tone & more compression (activated rear panel). Rectification of the high voltage supply on this model is handled by a GZ34/5AR4 rectifier valve (tube). 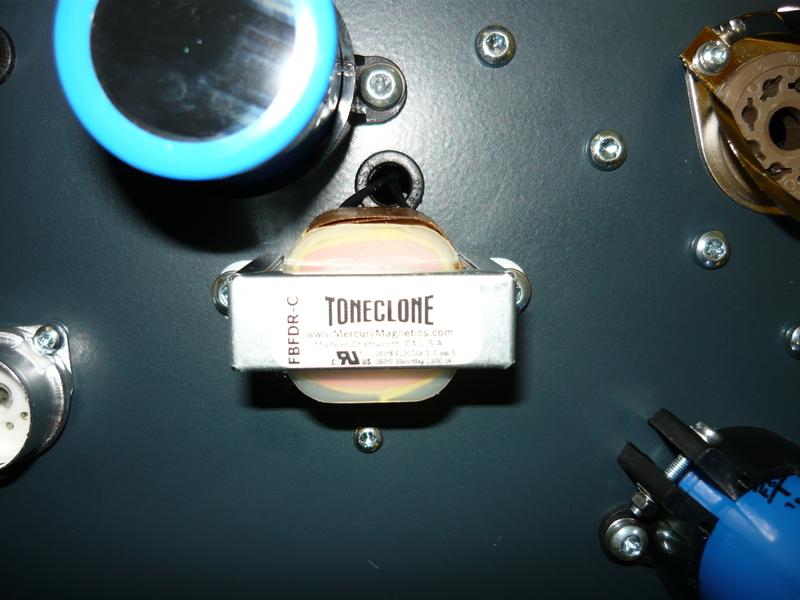 The basic tonality of the Blue Mood amp is inspired by everyone’s favourite early 1960’s amp from California, as exemplified by the Mark Knopflers, the Stevie Ray’s & the Brian Setzer’s of the guitar world. We just go out of our way to make it a little fatter, a little warmer & a little sweeter. The front panel controls are as follows: single high-impedance input jack, volume, treble, middle, bass (with EQ pull-shift), FX Loop send level & send jack, FX Loop activate/bypass switch, FX Loop return jack & return level, (active) prescence control, master volume (pull activate), standby switch, power on/off switch, neon power on indicator. 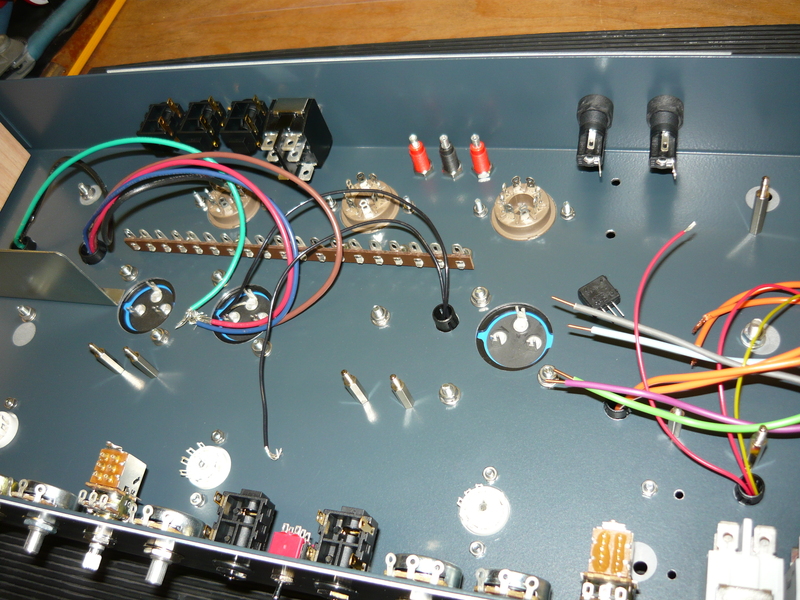 The rear panel controls are as follows: 240V/IEC power inlet; mains fuse, HV (high voltage supply) fuse; bold/vintage switch (selects mode of operation for 6V6’s), bias test points (for 6V6’s), line/DI jack, pair of speaker jacks (wired in parallel), speaker impedance selector switch. 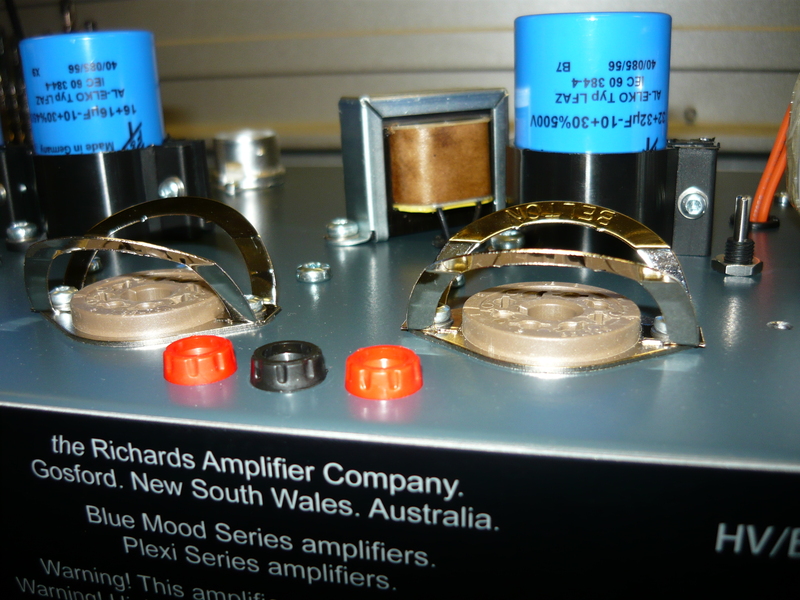 The Richards Amplifier Company – Australia. Each & every amplifier is individually hand-assembled, hand-wired, one at a time, by one person from beginning to end, to a specific customer order. This entry was posted on July 17, 2012 at 12:18 pm and is filed under Amps, Friends of Ivan Richards Audio. You can follow any responses to this entry through the RSS 2.0 feed. You can leave a response, or trackback from your own site.